I send only a very short case, but from my viewpoint a very interesting one. It is about quarter of a year, when an unhappy mother came to me with her 5 year old son, who had since more than half a year nightmares accompanied by regular bed-wetting. Otherwise he was healthy. From the children’s illnesses he had German measles. I recommended AUTO in single use, diluted by 6 l, followed by observation. Check-up control should take place in month and a half. Instead of the control, the mother called me that everything was resolved. They will contact me again, should it be necessary. I did not contact you a long time, but this does not mean that I did not work or did not have interesting cases. I was caught in the whirl of daily activity. Right now I have a virus infection, I am in bed, and so I have time and peace and quiet for all the things I wanted to do. And at the same time I naturally also use autopathy and so I think that my illness will take about 3 days and of course without any medicaments or physicians. Since the last time, that is since the conference, which unbelievably charged me, I have tried absolutely everything. I have to say, it is a real hit, everything functions – water from the tap, chakras, combinations. I started to work more with my intuition. In acute states I started suggesting repeating autopathy in low potencies in short time intervals, for example after an hour, the results are absolutely amazing. In my case the fever was reduced from 39,5 to 37,5 within 5 hours after I had applied autopathy 3x and only stayed in bed without medicaments, which was great, and other symptoms – pain of the back, of the large joints, the head, malaise, were either non-existent or negligible, and this I consider to be the real hit. Please excuse the words I use, but you have to understand that when through a simple spit, breath or holding of some glass flask over a particular part of the body one can achieve such results, then enthusiasm and euphoria are more than in place. I lead my clients even more towards respect of this method, I stress the importance of the intention with which the preparation of the dilution is approached, and I see, that I am doing well. I have made the connection between the preparation of the dilution and cooking and so I ask them, how a meal that was prepared with love, care and in a good mood will taste and how the same will taste when cooked by someone who is angry, swearing, hurrying and will cook only because he/she has to. What could you expect from a bottle, when you consider it to be only piece of glass and depreciate its power? What can the autopathic dilution do for you when you consider it to be some kind of water, possibly dirty from the spit and you do it only because I told you that it is good for you? I have an inexhaustible number of cured cases – acute and chronic, colds, angina, ulcerative angina, headaches, eczemas, unsleeping child, a whole scale of various pains from the thumb till recurring nodules, hair loss, depressions and, according to one client, also a warded off suicide. As I have already written, it is an unbelievable adventure, sometimes the effect comes with a delay, and this is mainly when I am sure enough which course it will take. The last such case was of a woman who came to me with headaches, pain in the knee, the ankle, having to use a walking stick. She used autopathy 4 weeks and the knee started to get better, she was euphoric, almost went crazy with joy that she can bend the knee without pain. But then the headache got worse and so we applied autopathy 3x in one day. The headache got better, after a month she called me that she can walk without the stick, but that the headache is worse. I recommended again to repeat the application 3x a day and now I am waiting. As she does not contact me, she is probably ok. I am writing only briefly because you are very busy. I want you to know that your work lives in your pupils and we pass it with love and respect onto others, it improves the quality of life of our clients, and I also think that it makes better people also of us, the healers. Every day I look at my clients and I am grateful that I can do work that I love with all my heart. I am grateful for all the things that I had the chance to learn, for all my teachers who brought me further in life and shared with me all their knowledge and you are amongst them. I wish you wonderful days filled with good things and kind people. PS: I cannot leave this out. In the summer I was with my daughter in Turkey. Everyone packed with them huge amounts of medicaments – for diarrhoea, vomiting, fever, vaginal problems, headache… I think it would fill the whole page. I brought with me 1 bottle. When on the 2nd day my daughter got a tummy ache, I gave her 3x in succession 2 l, 2 l and 3 l – in a single day, in the morning, midday, evening, and already in the morning of the following day it was OK. For me I made now and again an SOS from a bottle cap. Almost all women had vaginal problems, and now and again diarrhoea and vomiting. The two of us had nothing. A small thing that made my vacation more enjoyable. The last time I have written was in July, when we worked together on the shingles in my operated hand, which I had already for the second time after oncological sampling. I must tell you that last week I was again at the regular check-up at oncology. All results from sonographic and blood tests are perfectly ok. The physician even informed me that the hematoma on the liver (he had found it 5 years ago and said that it is common in women over 45 and that with age it can increase in size or in number) has decreased its size from 18 m to 14 mm. The last time we corresponded about how to proceed in order to stop getting the bacteria of shingles at the next blood test. I must tell you that immediately after I came home from the examination and the blood test, I preventively made autopathic dilution with 4,5 l from boiled saliva. I repeated it the next day – I was worried that what I have experienced already 2x does not repeat. The week before the blood test I have increased the doses of water with kitchen soda and tried to avoid sweet foods and sugar. Today it is a week after the sonography and the blood test and everything is fine!!!!!! I am also very happy that my results are perfectly ok!!! The physician at oncology told me that my blood picture is impeccable and that in cured patients who have undergone chemotherapy this can be seen only rarely! So Mr Cehovsky, autopathy had demonstrated again, how excellent and irreplaceable healing method it is! Additionally I have to tell you that I have never felt so marvellous as now, and this after cancer and after the age of fifty! I enjoy every day, I have continually a good life-feeling and I believe in myself. My daughter Petra, who thanks to autopathy had a marvellous pregnancy and natural and quick birth, when she gave birth to a healthy boy weighing 3,66 kg, continues with autopathy. Although as mother she is aware of the treacherousness of inoculation in children, but she does not have such courage as to leave Tomas without it and her husband wishes that the boy is inoculated. So she takes Tomas to be inoculated and when she comes home she makes autopathy for him. The result – Tomas is a beautiful and happy baby, he does not have any reactions to the inoculation as other children do. He also sleeps nicely the whole night, has always a smile on his face and is absolutely content the whole day. I thank you for everything, and this not only for me but also for my whole family (all of us, all 4 generations, use autopathy). I cannot express it in words, how much you helped me and the whole of my family by autopathy!!!!!! 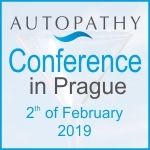 Thanks go also to Veronika Kucerova who introduced me to autopathy and also helped me. I practice yoga since 20 years and chi-kung 9 years. I have read your articles in your website autopathie.de/novy and also your book Get well with autopathy. I think that it was the 3rd edition. I have lent it to someone and do not have it anymore and so I bought the 3rd edition of your book Autopathy, a homeopathic journey to harmony. In the past I had a go at studying homeopathy and acupuncture and so I use autopathy longer than 3 years. In the beginning my interest was small, but it increased in time when through yoga and chi-kung exercises I developed the ability to feel the energy flow. In yoga this is called prana, Chinese teachings call it chi. Below I will use the term energy, although it is a life energy with varying vibrations in the body that finally flows also outside of the body. At the beginning, I tried to cure with autopathy various physical illnesses, which I mostly managed with parallel application of yoga, chi-hung and autopathy. Some of it I still have, but I hope that with time even this will pass. But I mainly wanted to share my experiences with feelings that autopathy in various dilutions – potencies causes in my body. Thanks to the awareness of the energy flow, I also feel barriers in the energy flow – blockages, which I feel more or less until today dependent on vibrations – frequency of energy flowing through the body. After the application of autopathy in potency C500 I felt increased emanation in the area of the 6th chakra that caused also increased flow of energy through the body. I started high, due to my long experience with yoga and chi-kung. To make the preparation I use water from the well near our house. When I repeated autopathy after a week, the flow of energy caused an increased pressure on the blockages in the head and the top of the head until the time when the functioning of the autopathic preparation weakened, or after a meditation with a person who has a higher vibration level. After such meditation I came to the conclusion that it is a case of regulating increase of vibration energy, because the blockage was not felt anymore. In everyday life I did not succeed until now to keep such a high vibration (in spite of daily exercises) and after a while I began to feel the blockage again. And so I applied autopathy again with a gradual increase of the time of the flow of water through the bottle with the usual result: increase of vibrations in the area of the 6th chakra and the increase of the energy flow though the body. When I arrived approximately at 1M (10 minutes of water flow though the autopathic bottle), then the energy was above the head like a flame. So I had the idea of using the autopathic preparation also on top of my head, where yoga places the 7th chakra. This increased somewhat the flame of energy emanating above the head. After gradual increase of the flow of water through the autopathic bottle, I have once tried what effect the autopathic preparation will have on me using a flow of water of 3, 5 hours. It was probably very fine, I think that my sensitivity on this level was not developed yet, and so I registered first after a longer time the usual flame of energy over my head as the vibration decreased. As I was not sure of the effect, I did not repeat this dilution. After this, you have published on your web the preparation with the method of heated up saliva and using breath. I have tried it all with the usual result. Only now, the higher guidance had given you the information about preparation from pure prana on the level of the 7th chakra. I was really happy about this, because I have been considering how to improve the quality of bodily fluids for dilution. I have thought, perhaps I can irritate my eye and use the tears, but I did not have the courage to do this. After about one week of thinking about it, I have used your idea. I was only sorry having to throw away my old autopathic bottle after having using it 1, 5, months. I came to the conclusion that a little of old bodily information cannot do any harm and I used the bottle for the preparation from prana. I have held the bottle approximately 15-25 cm above the head, using 5 litres water. I arrived at this quantity through gradual increase, although I have decided to use lower potencies from flow of 1, 5 litre water with gradual increase by 0, 5 till 1 litre. iI have poured the drops of the preparation on the back middle channel (du-maj) till the back of the neck, where some publications about yoga locate the back outset of the 6th chakra. Then, as every morning, I mediated one hour. The effect as usual, fine flame of energy glowing over the head, but this time with the difference that I did not feel the blockage in my head and the energy flew through as if there was an opening. Also meditation was more soft and the dissolved tamasic energies rising from the legs and from under the feet (Kvetoslav Minarik recommends their abstersion as first) did not settle in the head and did not cause sleep states, which is a great help, because heavy energies can be absterted longer and so also quicker. When using new autopathic bottle, I felt softer effect of the autopathic preparation that was not influenced by old body information. It was only a short experience up to now, but POSITIVE, and so I write it to you, so that you know, how I tested this new method. I thank you for your work and for making human life better and I hope that there will be more and more of those who will thank you.